Who says that rooms need to have walls? With an outdoor living space, you can replicate all of the comfort that you value indoors, with the added bonus of nature’s beauty. Do you dream of cooking full-course meals while unwinding in the summer breeze? Or, how about catching up with your favorite TV show as the sun goes down next to your outdoor fireplace? At Topaz Design Group, we surpass the boundaries of walls. With our designs, the sky is the limit! 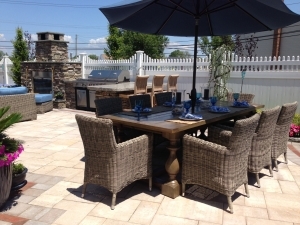 Whether you want to cook, dine, entertain or relax, our outdoor living spaces are customized to meet whatever needs you may have. Explore our gallery to take a look at some of the outdoor dreamscapes that we’ve brought to life. Topaz Design is a full-service design and build company that handles every aspect of your outdoor project. This way, you will never have to experience long gaps between project phases. Fully involved in your project from beginning to end, our team is committed to mastering every element of outdoor design and installation service. And best of all, your project will be completed seamlessly and efficiently so that you can enjoy your outdoor paradise as quickly as possible. We are proud to provide homeowners in our service areas with the chance to enhance their Long Island landscapes beyond what they ever thought possible. With this new living space, you can extend your time spent outdoors, all while savoring the superior comfort that’s typically found indoors. To get started with your own project, complete our online form today and the Topaz team will get back to you shortly.